Make 2018 Your Best Social Media Year Yet! Get Ready to Make 2018 Your Best Social Media Year Yet! The new year is approaching fast but is your brand ready for 2018? Do you know how to build and keep consumer trust? Do you know how to stand out on social media without putting your foot in your mouth? Can you steer your social media interactions towards success instead of disaster? In the end, it all comes down to knowing your own brand well and taking the right steps to make sure consumers know what you stand for as well. Here is everything you need to make sure you will absolutely own 2018 on social media! One crucial turn-off on social media is when a brand’s various social media profiles don’t even remotely look and feel like they belong to the same brand. It’s harder for consumers to recognise and recall your brand, and you’re wasting valuable opportunities for creating brand loyalty. A cohesive brand presence eliminates brand confusion. Create a unified brand experience over multiple channels. Create a customer journey that overarches all channels. Part of creating a cohesive brand experience is having a clear and recognisable look. And I don’t just mean your logo. Keep your visuals similar on all channels but adapt them to channel specifics (size, format, etc). Your Facebook header should not be wildly different from your Twitter header and so on. Create a style guide and stick to it! Make it really easy for consumers to recognise your brand from a mile away. For example, the website Very British Problems is immediately recognisable, whether you look at the website, the Twitter or the Facebook account — because the branding is cohesive. Know your brand, know your voice, and create a voice guide that clearly outlines these. Make sure that everyone working on social media sticks to it. If necessary, adapt your brand voice slightly for each channel if your audience differs depending on the social network. Being current is, of course, important to most brands, but don’t try to emulate something you aren’t. Stick to your believable brand voice instead of trying to adopt slang terms just to seem hip. A recent study from Sprout Social showed that performative coolness is way overrated and not a trait consumers look for in a brand. It’s more important to sound authentic and be genuinely you instead of trying to keep up with the cool kids. This also helps you avoid the embarrassment that comes from appropriating slang or using it badly. More and more consumers care what’s in a product. Many also care what’s in a brand. 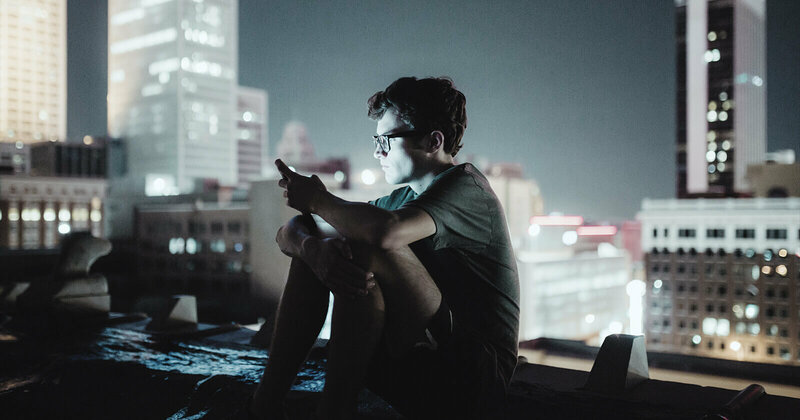 Especially considering the rise of fake news in the past years, consumers have become wary of things they read online. Consequently, it’s more important than ever for brands to stay honest and earnest in their communications, on social media and elsewhere as well. Honesty is a vital part of creating consumer trust and loyalty. Trust isn’t something that magically comes into existence from one day to the next. It’s something you create with all of your actions as a brand, step by step, over time. Of course, it seems like a good general rule for human beings to show others respect, but don’t forget it also applies to brands. How you behave on social media can have a strong and lasting impact on your brand. Don’t engage in racist, misogynist, homophobic, transphobic, ableist language or actions. Consider other people’s feelings. And when someone jumps down your throat, don’t retaliate in anger. Always stay respectful, even when tempers are running high. Sometimes that means taking a step away and counting to ten. Other times you’ll have to hand the matter over to a colleague who can keep a level head. Similarly, you have to keep a cool head when someone calls you out on something or you make a mistake. One of the worst things, when people or brands have made a mistake, is the fauxpology that follows it. “I’m sorry if I hurt someone…” is not a proper apology as what you’re doing is shifting blame to the person who got hurt instead of accepting that you did something wrong and apologising for it. Apologise properly, genuinely and publicly. Tackle problems head-on and handle negative comments as soon as possible instead of letting things simmer. Company culture is becoming more and more important these days. But company culture isn’t only relevant for employees and job applicants at a company. Fans and consumers of a brand also care about that brand’s culture. In the digital age, information about how a company treats its employees slips through — by word of mouth, in news articles and on social media. But it’s not just about making a good impression and having a clear conscience. Having a good company culture creates happier employees. And happy employees are the best brand ambassadors you could wish for. User-generated content or “earned” content is one of the best creators of trust among customers. A trust survey by Olapic from late 2016 found that consumers preferred UGC over brand-owned content trusted it more and found it more honest than other content. There is almost nothing as effective as seeing other customers endorsing a brand or product on social media. Only actual word-of-mouth endorsements from family and friends have a stronger impact on buying decisions. A brand aiming for success in the upcoming year should definitely know and embrace the value of user-generated content and know how to collect UGC with hashtag campaigns. Of course, you can always combine a UGC campaign with an employee hashtag campaign, drawing on two trust-creating methods at the same time. Social media is a free-for-all. If you’re trying to win customer hearts on Twitter, Facebook and Instagram, you can bet that your competitors are doing the very same thing. So to stand out from the crowd your brand has to be recognisable (see above), consistent and interesting. Unfortunately, the line between humour and offensiveness is quite thin, and navigating that isn’t always easy for brands on social media, where the banter often moves quickly. You’d also be ill-advised to make fun of your own customers. And poking fun at other brands can work but should be employed with caution as it only rarely works out in your favour. Nothing is worse than a brand using social media as a megaphone. “Check out our product” they yell. “Look at me, me, me!” they plaster all over their social accounts. They have zero interaction with other people and are obviously confusing social media with ad space. But that’s not how social media generally works. People on social media crave interaction, they want human and personable reactions from brands. Treat social as a conversation and not a marketing ploy. 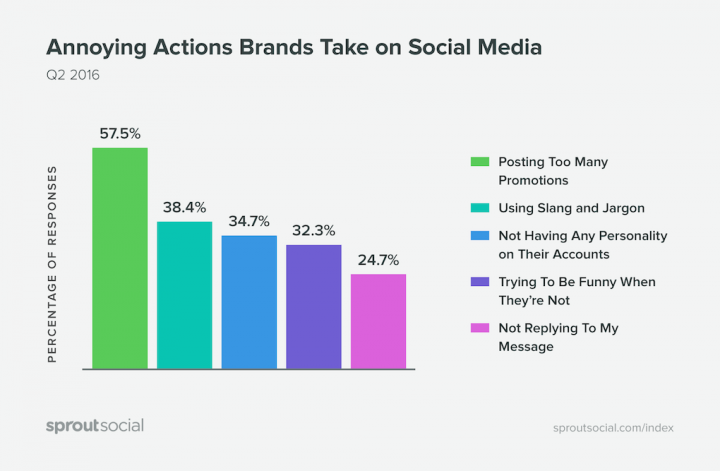 A Sprout Social survey from 2016 showed that 57,7% of users are severely annoyed by brands that share too many promotions. Instead, involve your audience by running interesting UGC campaigns — casually offer your products as rewards instead of just bluntly advertising them. Interact with people by replying to their posts or sharing their interesting and awesome contributions on your own timeline. Use social listening to find out when your brand is mentioned, even if you’re not being tagged and get in on that conversation. It’s not all about the hard sells — if you keep being entertaining and/or adding value to the timeline, people will keep following you and sharing your content. Furthermore, don’t be afraid to engage in a conversation with competitors if the opportunity arises. Monitor not just your own mentions but other brands’ mentions too, to not miss out on a chance to start a conversation with potential customers tagging your competitor. Brand hashtags are a great way to make it easy for people to talk about your brand. Having a widely used brand hashtag also lets you easily check for content posted about your brand. Your brand hashtag can be a tagline or simply your brand name if it’s unique enough. In any case, the hashtag should be uniquely you. KitKat simply uses the iconic #HaveABreak tagline as a brand hashtag. A brand hashtag doesn’t affect any other hashtags you may be using as part of hashtag campaign. Put in the work to get your brand hashtag known just like you’re doing with campaign hashtags. Encourage followers to use it whenever they’re posting about your brand and you will have a way to casually collect UGC outside of specific campaigns on a social media wall. It’s easy to forget that social media is forever unless you delete your posts — which should only be done under very rare circumstances. As it stands, the little things count, so make sure you take the time to fact check and spell check your social media posts before hitting send. Check you’re using the correct user handles when you mention someone. Social media is already the battlefield on which customer attention is won, held and lost. If you don’t take social quite that seriously yet, it would be a good time to start now. Take the new year as an opportunity to renew your social media strategy and your commitment to being the best brand you can be.